Between 1939 and 1946, 13 Sherlock Holmes films were created starring Basil Rathbone as Arthur Conan Doyle's one-of-a-kind, consulting detective. From 1984 through 1994 Jeremy Brett portrayed Sherlock in 41 television episodes. After 1994 a number of actors took a run at being Sherlock. None managed to capture the hearts of Sherlock fans. Then, in 2010, along came Benedict Cumberbatch and Martin Freeman, Holmes and Watson respectively, with Sherlock, an updated version of the timeless duo. They were an instant hit with British audiences, the world's most expert judges of Sherlock Holmes presentations. Through 2014 they have appeared in nine episodes. Personally, I loved the first six and hated the next two so much much I couldn't watch the 9th. Nothing went wrong with Cumberbatch and Freeman. In my opinion, their writers failed them. A few weeks ago, quite by accident, while looking through Amazon Prime Movies and TV, searching for something new to watch, Elementary, a Sherlock series staring Jonny Lee Miller and Lucy Liu caught my eye. In spite of our disappointment with Sherlock (the series), we remain Sherlock fans, so we decided to give the pilot a look. 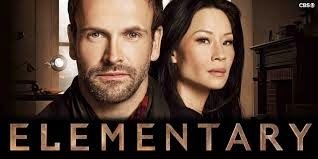 Elementary is a CBS series that is shooting its third season at this moment. We own the first two, forty-eight episodes, and we are currently watching them for the second time. I suspect we'll watch them all again, at least one more time before the new season begins. What do we think of the show? Well, that's elementary, isn't it? Here's what Jonny Lee Miller said about the series: "For me, there are two different things that make Sherlock, Sherlock. One is, you know, within the books: obviously he's a genius with an attention to detail, his ravenous hunger for all aspects of knowledge that might feed his work... But the major thing that makes him Sherlock is his relationship with Watson - their friendship. For me, that, I guess is the biggest side, the more interesting side than the genius." Jonny Lee Miller is one of the best, if not the best actor its been my pleasure to watch. The writing hasn't missed a beat since episode one. If Sherlock (the series) is an indicator, the third season could break the spell, but frankly, I don't believe that will happen.